Not many people know that Weavers used Herbs to color the clothes to remain disease free. Natural dyes get obtained from plants, animals, insects and the minerals. According to Naturopathy, herbs and food we have are our disease healers. If the dyes made out of herbs are used to color the clothes, we can remain disease free bodily. Such info is available from the exhibitors of carnivals on clothes held over in the major cities of the world. The weavers and artisans narrate the stories as to how their ancestors kept themselves free from diseases for a long time. They continued the tradition and know-how to share. It is known to the modern medicine that in opposition to natural dyes, artificial dyes produce skin and other diseases. The use synthetic dyes and its application on fiber are creating environmental pollution like water and air pollution, and cloth manufacturing is prone to health problems to users and workers involved in the industry. Natural dyes are colorants obtained from plants, insects, or minerals. The bulk of actual dyes is from plant origins roots, berries, bark, leaves, and wood—and other organic sources such as fungi and lichens.The essential process of dyeing changed little over the time. Typically, the dyestuff is put in a bowl of water and then the textiles to colored are added to the pot, which is heated and stirred until the color is transferred. Via. The Bagh print preparation is very complicated and tiring. It takes 25 to 30 days to pass through the process. The castor oil, sea salt and goat’s excreta or the feces and urine get dissolved in Hvanj bulb mixture. After drying up the final time, it is immersed in BAHEDA mixture ( An Indian Herbal fruit). Wooden blocks get used to print various designs on the cloth. The cloth gets printed using the wooden blocks designs by the artisans and dried for 15 days. It gets soaked in the running river water. Further, in the process, ‘Dhavli Flowers and Alijarin medicinal plants get boiled in the water. The batik print gets finished by the Chippa people settled in of Ujjain and Bhairavgarh area of Madhya Pradesh, India. Honey wax is used to prepare this cloth, that is skin friendly, and the treated fabric maintains the body moisture. The feel of the clothes using natural dyes such has a soothing effect on the skin when compared to synthetic materials that give electrical sensation by attracting the forearm hair. This effect is felt immediately on wearing the cotton or synthetic clothes. 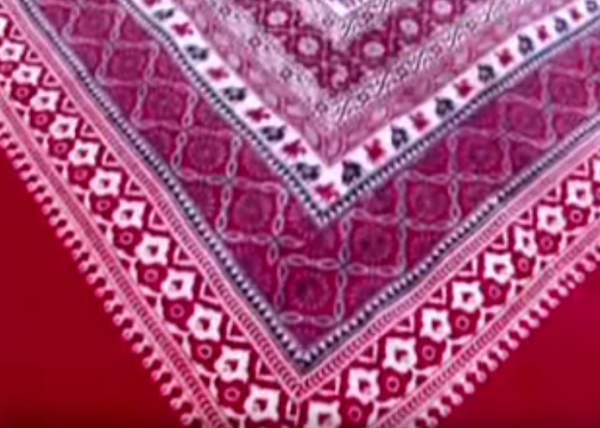 Dabu Print is a unique print by itself and prepared in the mud. Ladies of royals origin used them as the shawl.